Today competition is in every field has increased a lot and to be different from other employees, we have to do different things. There are certification in every field and to get good recognition gaining certification is very important. Not only it increases competency but also gives professional recognition. 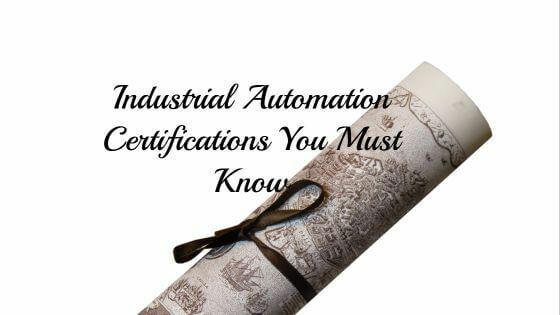 So today in this post we have listed some industrial automation certification, which will help you in boosting your knowledge and career. Subscribe to Automation-Talk by Email. 1. ControlLogix Certificate Program by Rockwell: Rockwell automation is a well know company in automation and their PLC's are used in every sector. So if you are a PLC programmer having experience in ControlLogix PLC's, then this certification is certainly for you. This is a self-preparatory program and you will have to follow the given syllabus. You will complete a series of three required ControlLogix courses related to your maintenance or programming job responsibilities, plus one course elective. To earn the ControlLogix certificate, the program requirements must be completed within 12 months. For more details please check here. 2. RSTrainer for RSLogix 5000 Software: This is another certification program by Rockwell which is a computer based training. To clear this certification you can get study material after registration and this course is available in both computer-based and web-based delivery formats and is part of a series of e-Learning courses designed to teach you RSLogix 5000 software. 3. 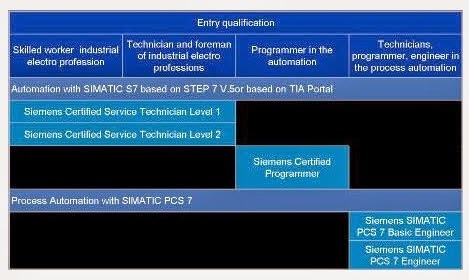 SITRAIN Certification Program: This is the certification program by Siemens and under this program, there are many certifications. This is a worldwide recognized program and the certification is valid for 3 years. Below chart shows the entry qualification for each certification. The certifications are divided as per PLC make and model viz. Certification based on SIMATIC S7-300/-400 with STEP 7 V5.x and Certification based on SIMATIC S7-1500 with TIA Portal and there are some compulsory training which you must attend before attending these certifications. There are also certifications in the Process Automation field. Get more information here. 4. Professional Certificate of Competency in Programmable Logic Controllers (PLCs) & SCADA Systems: This certification is from Engineering Institute of Technology (EIT) which is endorsed by the International Society of Automation (ISA). This is a general purpose certification course for new learners and include basic concept of SCADA and PLC system, PLC programming (ladder logic), industrial communication protocols, PLC panel designing and much more. Syllabus, fees and more information can be found here. Apart from this certifications, there are many local institutes which gives you the PLC programming and SCADA training at low cost. In this program they teach about 2-3 different make PLC, SCADA, PLC programming, Electrical etc. If you know any other industry wide automation certification, please let us know through your comments. What about certifications from Schneider Electric? Yes, Schneider Electric also provide different certification in Automation field.Have your done any certification from Schneider Electric ? The reference link is given in the post. Please refer that link. Does anyone have any idea about the quality of the certification course from EIT , number 4? Hope some one will reply for this query of yours. We have listen they are good. Do you have any idea about the courses offered by scantime? Are they useful for carrier prospective? We don't have Idea. But there course looks very informative.